I missed this a few days ago, but imagine that the first quarter results at Harley-Davidson were like eating a bag of those Krinkle Cut™ Salt & Pepper chips… a great taste with a satisfying crunch! Yeah, I have a weakness for the hyper-engineered, overly marketed, addiction-creating potato chips. But, I’ve digressed. Q1’14 Financials: Harley-Davidson reported its first-quarter 2014 retail sales in the U.S. were not as high as expected — in large part because of the brutal winter season that gripped the eastern two-thirds of the country and the absence of the Road Glide models. Still, sales increased 3 percent in the first quarter of 2014 and the motor company maintained a 56 percent market share in the U.S.
On April 22, Harley reported it sold 57,415 motorcycles worldwide in the first quarter of 2014, a 5.8 percent increase over the same quarter last year. The increase helped boost the company’s total revenue by 10 percent, with earnings up 22 percent. Most of that growth came from international sales as dealers sold 21,685 motorcycles, an increase of 10.9 percent compared with the first quarter of 2013. Sales in the U.S. increased by 3 percent over the same period last year. The company had net income of $265.9 million, or $1.21 a share, for the quarter which was up from net income of $224.1 million, or 99 cents a share, in first quarter 2013. Harley-Davidson said it expects to ship between 279,000 and 284,000 motorcycles in 2014, which would be an increase of between 7 and 9 percent from 2013. It was noted in the financial call that the absence of the Road Glide models continues to impact the company’s bottom line which in the first quarter of 2013, sales of the Road Glides represented 10 percent of its sales. After the earnings report was released, the company stock (HOG) went from $68 per share at close to establishing a new 52-week high of $71.99 per share. Then there was some additional investment buzz from stock analyst’s and then with impeccable timing on April 29th, Mr. Wandell sold 45,308 shares of the company’s stock. The stock was sold at an average price of $73.45, for a total value over $3.3 million. The sale was disclosed in a legal filing with the Securities & Exchange Commission, which is available at this link. Loan Payback: H-D announced that it paid off the $303 million, high-interest rate loan from Warren Buffett’s, Berkshire Hathaway Inc. during the quarter, funds that were used for Harley’s financing company. You might recall that during the stock market crash of 2008, Harley’s finance subsidiary was unable to loan money to customers because the capital markets had shut down and liquidity was running low. 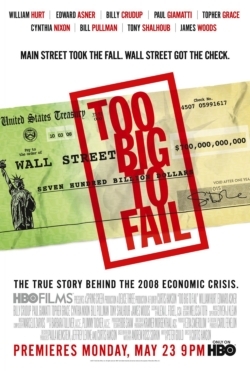 You may have read the book or watched the “Too Big To Fail” television drama film on HBO? The money/loan helped Harley-Davidson continue financing motorcycles through its financing company, but the loan came with a hefty 15 percent interest rate. It was a bridge that H-D desperately needed and Berkshire Hathaway was the only company from which Harley could borrow money without giving up its equity. 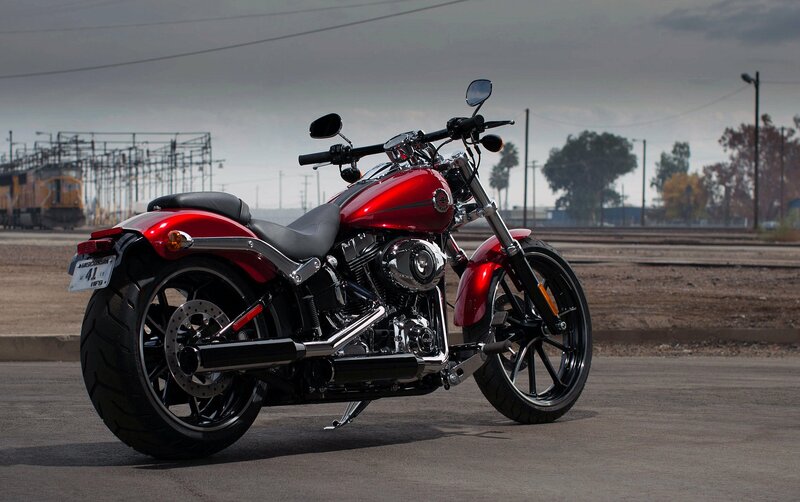 FXSB Recall: The only dark cloud in all this good news hoopla was the motorcycle recall on 2013-14 FXSB and FXSBSE models manufactured from March 20, 2012, through March 10, 2014, to identify and fix a problem with the fuel level sensor signal. The NHTSA Campaign Number is 14V185000 and effects approximately 9,100 motorcycles. It turns out that suspension variances may affect the gas tank mounting angle, causing the fuel level sensor to read inaccurately. “The gauge inaccuracy may cause the motorcycle to run out of fuel unexpectedly, possibly even before the Low Fuel Warning lamp illuminates,” the recall stated. This would cause the motorcycle to stall, increasing the risk of a crash. Harley-Davidson will notify owners, and dealers will update the software to recalibrate the fuel level sensor signal, free of charge. Sometimes it’s hard to rise above in our country, because the haters are lined up to tear you down. But, I want to say congrats to Harley-Davidson! I’ve got a mental image that the senior leadership team is doing celebratory high-fives, along with a Wandell victory dance or a watching Mark-Hans Richer air-guitar somersault on the board room table. 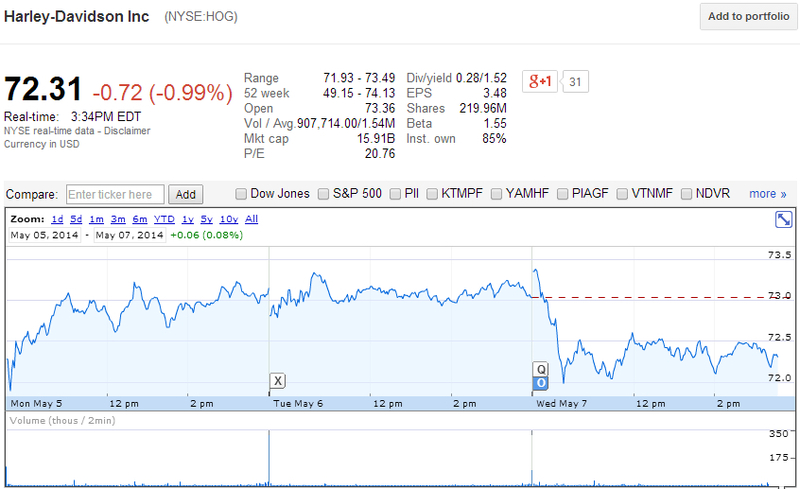 Photo’s courtesy of Google Finance, H-D and HBO Films.